Relevance refers to how close your product, offer and content is to the user’s goals and needs. 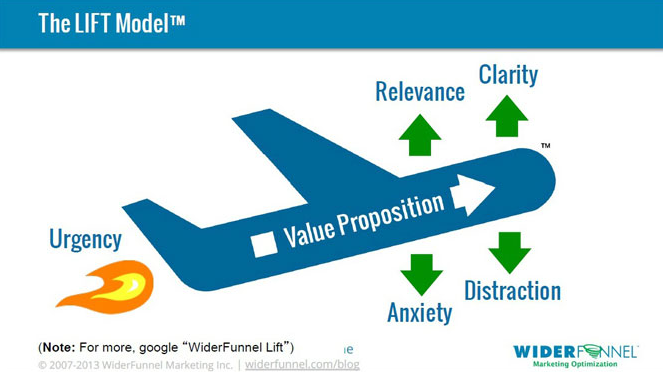 Relevancy is one of the six key drivers of conversion in the Lift Model developed by Widerfunnel. We use the Lift Model as a useful framework when carrying out an heuristic evaluation of a website or app. The more relevant your offer and content is to what the user is looking for the more likely they are to continue along your user journey. People have limited attention spans and so if your content does appear to be relevant to the user within a few seconds they are likely to leave your site and search for another site to help them meet their goal. Create a consistent experience as inconsistency creates dissonance. Source relevance – engage and motivate visitors to move them to the next step by using point of difference that is relevant to the source. Align content to the ad message as message mismatch weakens or loses the scent trail. For example pay-per-click (PPC) marketing is all about relevance as Google uses the relevancy of a landing page as an important factor in its quality score. Look at the relevance of ads and landing pages to keyword phrases that customers use. Use words that are familiar, don’t use synonyms and send visitors to a landing page. When people are in search mode they look for patterns and so ensure these patterns remain clear and prominent (e.g. keywords and images). When using email marketing to drive traffic to your site ensure you customise and have consistent content on your landing page that relates back to the email content.